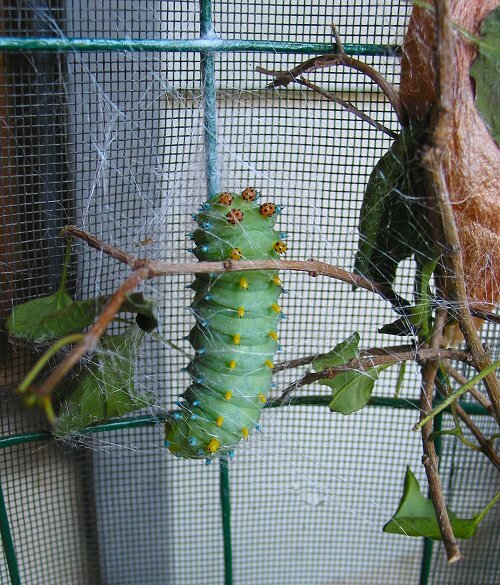 I started raising and releasing Cecropias a few years ago when a friend gave me some caterpillars. 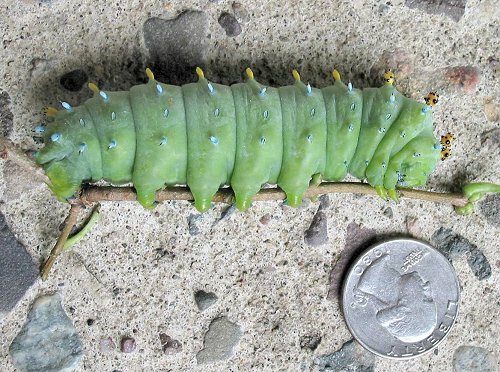 She had gotten started when another friend had found a female moth on the sidewalk, laying eggs. So I've been able to watch the whole process in detail - but mostly in cages, not in the wild. I do keep them outside the during whole year, so the timing is the same as wild moths. 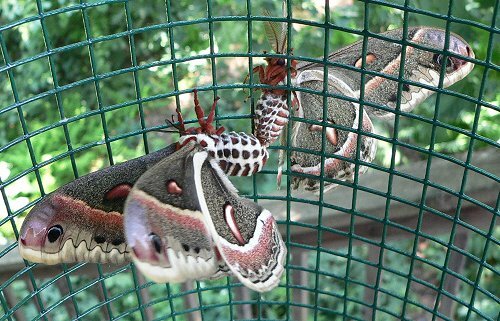 For me, the process starts in late May or June, when the adult moths hatch from the cocoons where they've spent the winter. A few times I've been watching just as a moth starts working its way out of the cocoon. Here's a sequence of photos of that - it takes just a few minutes. 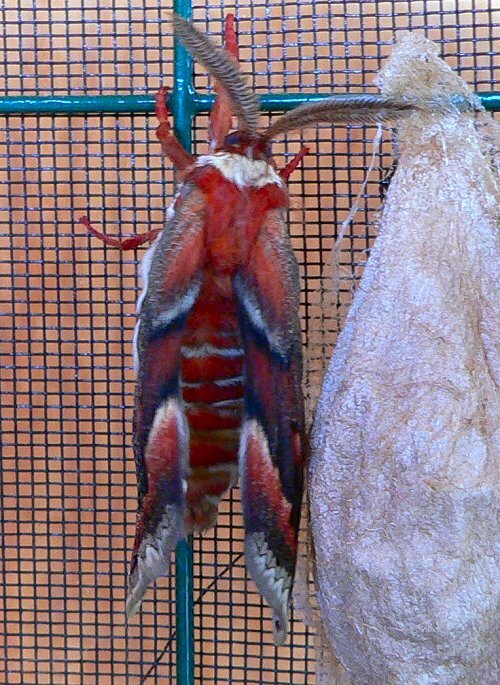 Here's a link to a video that my husband took of the moth pumping up his wings. The moths usually mate the first night after emerging. 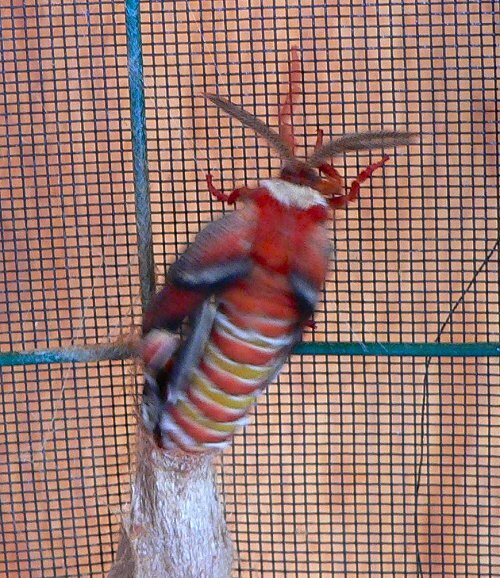 (I let the males go, and keep the females until they mate and lay a few eggs.) Males usually show up to mate between 4 and 5 in the morning. They stay mated all that day. By evening they've separated and are starting to flap their wings against the bars of the cage. I release the males, and keep the females for a few hours until they've laid some eggs. 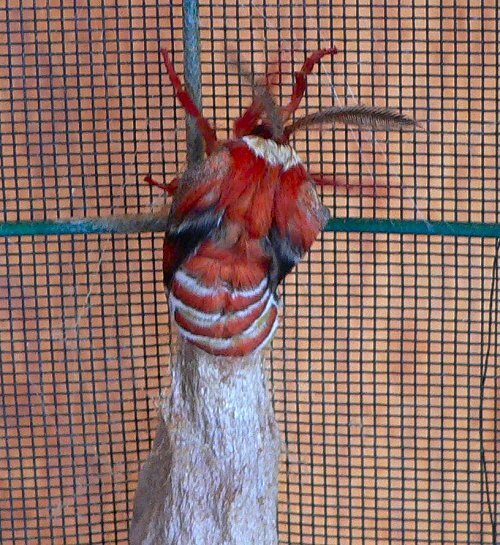 They'll lay eggs on any surface - leaves, paper bags, or the wire walls of the cage. 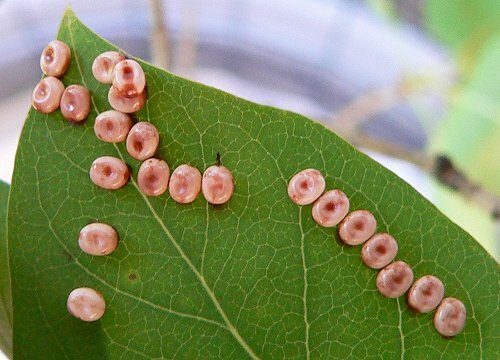 The eggs begin to hatch after about 5 days. 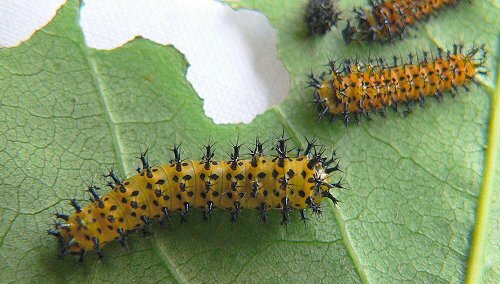 Cecropia caterpillars will eat the leaves of many different trees and shrubs. The lists I've seen include: apple, birch, elm, maple, poplar, cherry, box elder, elderberry and lilac. 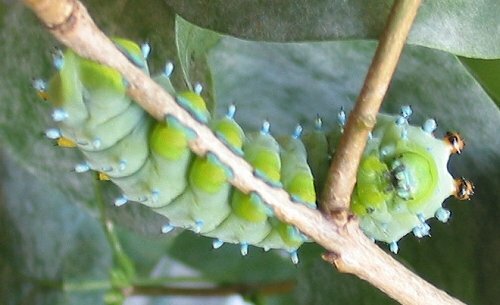 I usually feed mine on lilac, because I give many caterpillars away, and most people can identify and have access to lilac. 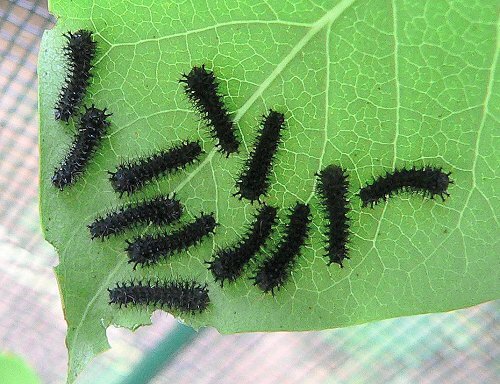 First instar caterpillars are black, with black spines. 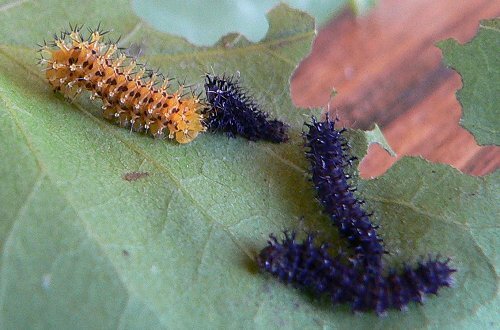 Second instar caterpillars are usually orange with black spines. Sometimes the spines are partly orange too. 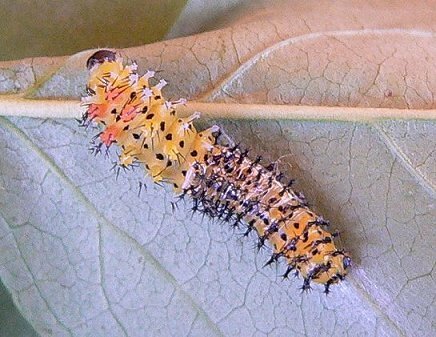 A second instar caterpillar shedding its skin. 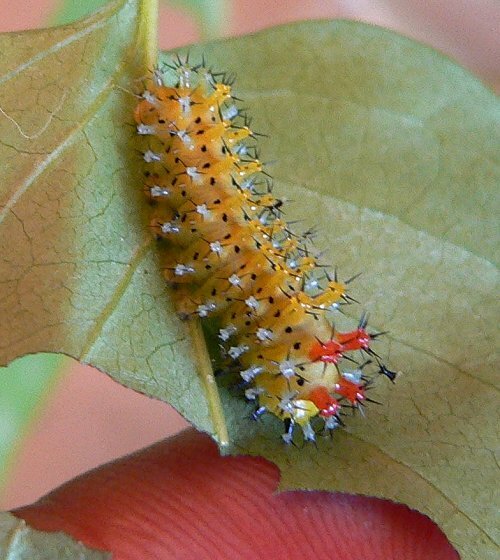 Last instar caterpillar with quarter to show the size. They're huge, at this stage, and eat a lot. 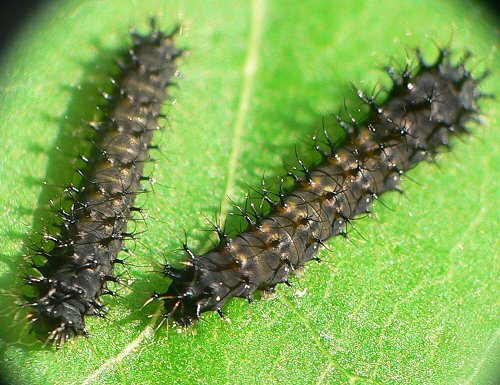 This process - the life of the caterpillar from hatching to cocoon - takes about 3 weeks. 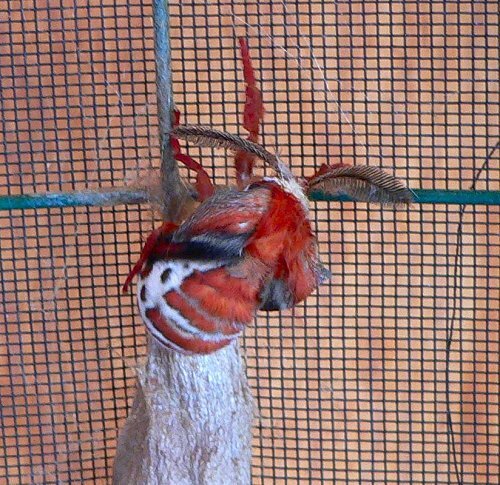 The caterpillars usually attach their cocoons to the walls of the cage. They begin by building a web of silk around themselves. 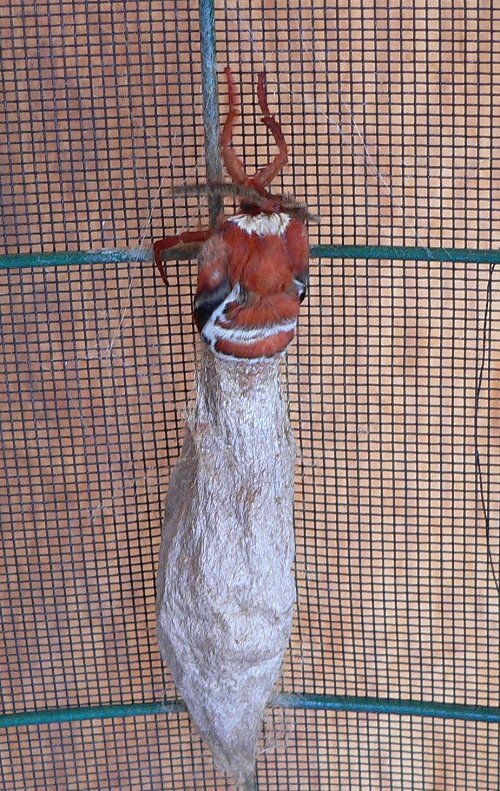 At the end of the first day, the silk is still white, and the caterpillar can be seen inside the cocoon. 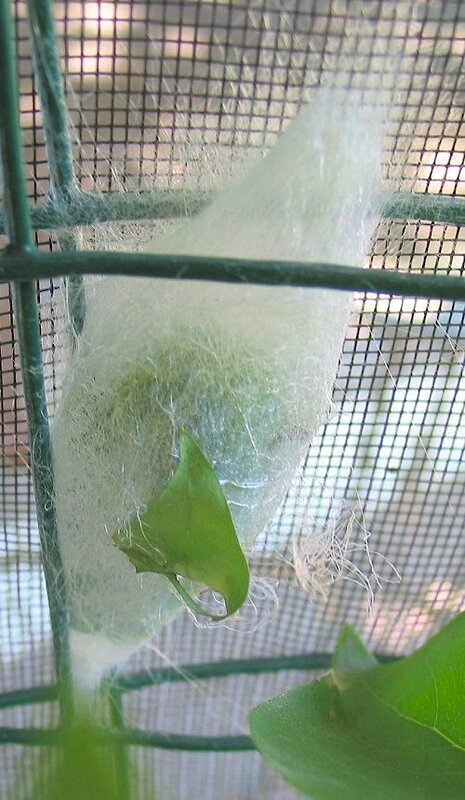 They incorporate any nearby leaves and sticks into the cocoon. 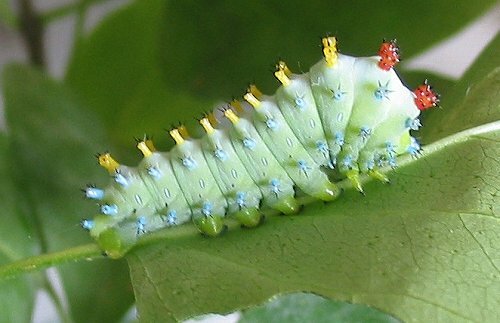 The next day the silk begins to turn brown and opaque, and the caterpillar disappears. 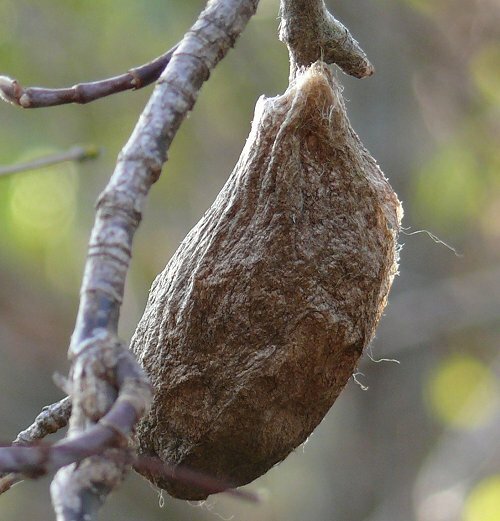 In the wild, cocoons are usually fastened along branches. This is a wild cocoon that I found on Box Elder. 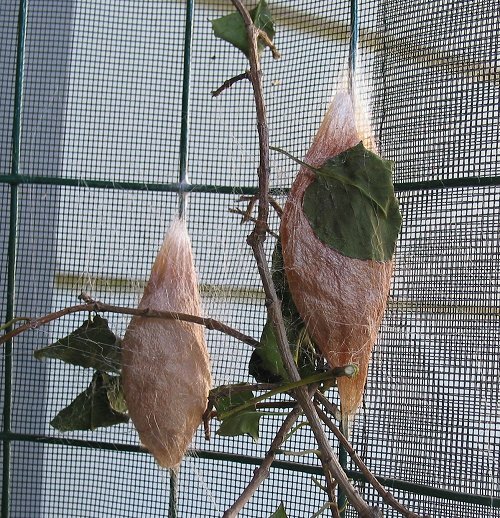 The cocoons spend the winter attached to their branch, and the adult moths emerge in the spring. 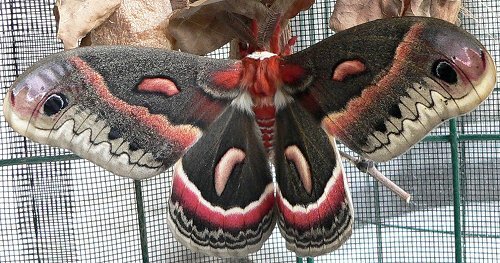 This entry was posted on Monday, February 23rd, 2009 at 11:43 am	and is filed under Lepidoptera, Moths. You can follow any responses to this entry through the RSS 2.0 feed. Both comments and pings are currently closed.